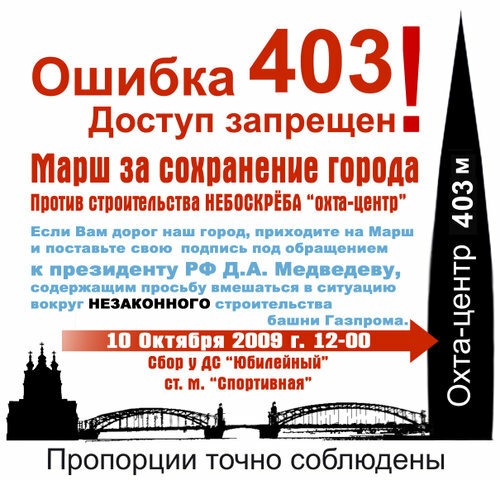 On October 10, the coalition of grassroots organizations and opposition political parties trying to save one of the world’s most beautiful cities, Saint Petersburg, from runaway redevelopment will be gathering along with other concerned citizens for a so-called March for the Preservation of Saint Petersburg. So-called because city authorities have nixed all the coalition’s requests for actual march routes, permitting them instead only a standing demo outside the Yubileiny sports complex, on the city’s Petrograd Side. Anyone familiar with current practices in the Cradle of Three Revolutions (and Russia in general) will know this means that the non-march is likely to be yet another “kettling” operation on the part of the police — hundreds (if not thousands) of beat cops, plainclothes officers, and the riot squad (OMON), plus metal detectors and barriers. All it comes down to is Gazprom’s naked ambition. They just want to be the biggest, the tallest. But what scares me most about this decision is the clear erosion of the rule of law it demonstrates. This is a precedent, a very loud one, showing that the legal norms are breaking down, that if you have the money and the access, you can do anything you want in this country. I have been pretty clear in the past about my views on UNESCO’s intervention in RMJM’s Okhta Centre project for Gazprom in St Petersburg, Russia. The plans we have drawn up are for one of the world’s tallest buildings in one of the world’s most horizontal cities, where only special buildings are allowed to break the grain. These special buildings include 30 churches, the Peter and Paul Cathedral, the Admiralty and the TV tower (which is the height of the Eiffel Tower). Each is special in its own right. A city needs a hierarchy of buildings so that the ordinary and the special work with each other. If every building attempts to be special, then they will all become ordinary; so there needs to be a good reason for a building to be out of the ordinary. The issue of energy is the central concern of our time and Gazprom, as the largest supplier of energy in eastern Europe, is one of the reasons for Russia’s wealth and rebirth, putting it into the ‘special’ category. The Okhta Tower must symbolise rebirth for Russia and the city of St Petersburg, while demonstrating that an innovative, low-energy building is possible in the extremes of the Russian climate. UNESCO has never disputed the quality of the design, nor the fact that the tower sits some 6km from the historical centre. But it feels it cannot allow one project to break the city’s height limits, potentially opening the gates to a ‘free-for-all’ of new development in the city. In this case, there is no latitude in its thinking, no allowance made for creation of the ‘special’. Mr. Kettle is trying to put a good face on a very, very bad game, just like his employers at Gazprom and their bought-and-paid supporters in the Petersburg administration. In this article he plays fast and loose with the facts and with the character of the city where he plans to plop down his 400-meter-high monstrosity. In what sense does the planned skyscraper ‘sit’ 6km from the historic centre’? The distance between the skyscraper and Rastrelli’s Smolny Cathedral is certainly not 6km. In fact, Mr. Kettle’s tower would be directly opposite the cathedral across the Neva River (and thus crush it). This is not to mention the fact that the ‘special buildings’ he mentions are nowhere near 400m high, and what ‘dominance’ they do exert on the horizontal Petersburg skyline is achieved with thin, elegant spires, not huge masses of steel and glass, as will be the case with his building. While the TV tower is higher than these other ‘special buildings’, it is in fact located at a great distance from whatever point in the historic centre that you would care to call the ‘historic centre’. Visibility studies have shown, however, that Mr. Kettle’s tower would be clearly visible from any number of such points and would thus rudely violate the current skyline, which like the ensembles of buildings themselves is an explicit part of the World Heritage Site that the city and the Russian Federation have obliged themselves to protect and preserve. What is more disturbing is that from the very start this project has been accompanied by the lies and machinations of Mr. Kettle’s firm, Gazprom, and the Petersburg administration. In addition to its World Heritage Status, the city’s architectural heritage is supposedly protected by any number of local and federal laws which themselves should have been sufficient to prevent even the consideration of such a ruinous, violent project. Instead, as current practice shows, developers and bureaucrats have been happily bypassing all these laws, demolishing ordinary buildings and listed monuments in their drive to make quick profits. Without exception, everything that has been erected in their place is miserable junk from any normal architectural viewpoint, even from a viewpoint more tolerant of modernism and postmodernism than is usually the case amongst Petersburgers weened on neoclassicism and art nouveau. Let’s forget for a second about the murky story of how Mr. Kettle’s firm was awarded the contract in the first place. He will tell you about a juried competition with ‘public input’ or something of the sort, forgetting, I imagine, to mention that three members of the jury, including Sir Norman Foster, found the situation so scandalous that they resigned. Let’s pretend, instead, that RMJM won the contract ‘fair and square’. What has happened since that beautiful day for all humanity, especially its Russian branch? The city administration and Gazprom have been doing somersaults in an effort to bypass existing laws on historic preservation and new construction, including the newly minted Regulations on Land Use and Development which clearly stipulate a maximum height of 100m for new construction at the site in question. Worse yet, they have engaged in a vigorous and expensive campaign of obfuscation which has involved, among other things, paying off local celebrities to express their ‘support’ for the project, misinforming the public about its legal aspects and the city’s World Heritage status, commissioning ‘opinion polls’ that have been shown to have been faked and ordering visibility studies whose alleged result is that the tower wouldn’t be visible from anywhere (hence no one should worry). But why build a skyscraper that no one will be able to see? The worst aspect of their campaign, however, has been their mockery of the public hearings on the project and public concerns in general. In at least two instances, hearings were held without timely and clear notification of the public, amongst other procedural violations. That is just the icing on the cake, however. During last summer’s hearing (the second of three such events) the organizers paid several hundred ‘extras’ 400 rubles or so (approx. 8 pounds) to come to the hall where the hearing was held and express their ‘support’ for Mr. Kettle’s future masterpiece. Disturbed by these ‘irregularities’, a group of local activists and concerned citizens tried to shut the hearing down. They were eventually forcibly dragged from the presidium by riot police (OMON) and several of them were arrested. As this was happening, the Gazprom/Okhta Centre official chairing the event urged the skyscraper’s ‘supporters’ to cheer on these police thugs as they performed their necessary work. When the hearing was over, these pseudo-citizens dashed out of the hall to a spot nearby where they had been promised they would get their well-earned pay. Unfortunately, journalists were wise to this and also on the spot, so the supporters’ minders had to quickly arrange to pay them the following day at another location. Although these shenanigans were well documented in the local press, none of the people responsible for this abomination faced legal consequences or criminal charges. This brings us to the hearing held just the other day, September 1, whose stated topic was Okhta Centre’s petition to be granted an exception to the 100-meter-high zoning rule I’ve already mentioned. Let’s start with the fact that, once again, timely notification of the hearing did not happen. Worse, the hearing was scheduled for 9am on September 1. September 1 is called the ‘Day of Knowledge’ in Russia and is practically considered sacred; it is the first day of the school year, a day on which parents accompany their children to the ceremonial openings at their schools. The hearing’s organizers knew this, of course, and thus hoped to keep away some number of activists and citizens who might otherwise have attended. I also think that they hoped that the extensive press coverage usually garnered by the Day of Knowledge would overshadow any negative coverage of the hearing. The citizens and activists who did make it to the hearing faced a police cordon around the building where it was held and three (yes, three!) security checks before they could get inside. What is this if not intimidation? That would have been enough. It gets worse, however. During the hearing itself, several people who protested too loudly (by shouting and unfurling protest banners or placards) were pounced upon by thugs (euphemistically described as ‘Gazprom security guards’ in some English-language media accounts I’ve read) and dragged out of the hall, where they were beaten, kicked, and dispatched to a nearby police precinct. One of these protesters arrived there so bloodied that the police immediately sent him to hospital. Now that these pseudo-democratic rituals have been observed, Mr. Kettle’s employers can happily submit their height-regulations waiver to the proper commission and, I fear, expect quick approval followed by the local governor’s signature. So much for public input. I’ve described all this in such detail because it goes to Mr. Kettle’s strange argument about the ‘rebirth of Russia’. He doesn’t elaborate on this point, except to say that it has something to do with the wealth acquired from the export and sale of energy resources. In fact what we have witnessed over the past ten years is the rebirth of the Russian police state. Whereas in the past this police regime defended the absolute rule of an imperialist monarchy and then, later, a totalitarian bureaucracy, now it has been called upon to defend the economic, financial and political monopoly secured over the past fifteen or so years by a tiny elite of oligarchs and security forces officers. I don’t need here to go into the details of this group’s rise to power, which involves staggering crime, rampant corruption, the destruction of civil liberties, flagrant violation of human rights and the intimidation of the free press. All these things are all too well documented in the English-language media, to which I refer curious readers. So this is the ‘rebirth’ that Mr. Kettle has elected to participate in. Its expression in the architectural realm, especially (but not only) in Moscow and Petersburg, has been the wide-scale destruction of the architectural legacy, a catastrophe which has been unleashed to satisfy a real estate and new construction speculative boom fuelled by oil and gas revenues. Instead of investing in badly needed infrastructural improvements and strengthening civil society in the process, the new elite has been cashing in its newfound wealth and power to make even more money, in defiance of democratic norms and public needs. When it comes to Petersburg and the planned Gazprom tower, however, there is an added symbolic dimension. 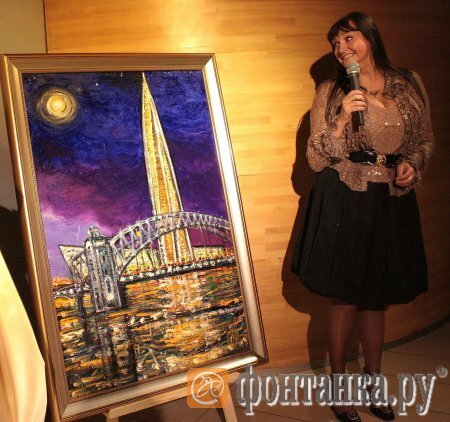 The skyscraper is meant to show that this heedless violent, criminal squandering of Russia’s future has ‘conquered’ all other possible outcomes and all other visions for the country. While the city’s social and political history has not been untroubled, to say the least, the building of the skyscraper would signal the triumph of this new ‘petrocracy’ and the end of Saint Petersburg, which after all was a utopian project. Mr. Kettle’s project, on the contrary, will be an emblem of the dystopia the country has again sunk into. In a better Russia, the competence and ingenuity of architects like Mr. Kettle would be used to build schools, theaters, hospitals, kindergartens, low-cost estate housing and other public buildings and spaces that would promote architectural innovation while not demolishing Petersburg’s outstanding, absolutely unique heritage. This project would not only involve popular participation, it would be generated by ordinary people themselves, who would democratically allocate the country’s common resources to make improvements to their own living, working, educational and cultural conditions. This, alas, is not the case, and Mr. Kettle’s Okhta Centre project is a gargantuan barometer that shows how much this is not the case. That is why I call on architects, journalists, activists and ordinary people in Britain and Scotland to shed what light they can on this project and pressure Mr. Kettle and RMJM to end their involvement in this crime against the people of Saint Petersburg, Russia and the world. This says that the site is temporarily inaccessible. Why? Because it has been subject to frequent DDOS attacks since it went online in late August. That is the level that Okhta Center, Gazprom, and the Petersburg administration have been operating on: petty thuggery. A very “special” building indeed. For some very special crooks. Since they are at the epicenter of the events surrounding this wretched forced-march pseudo-modernization of the city, the English-language St. Petersburg Times has had the most thorough and consistent coverage of the campaign for and against the Gazprom skyscraper. Here is a more or less complete selection of their articles on the subject from the last two and a half years. We think it might be a useful primer for those of you who want to get up to speed on the story. Once you’ve done that, write to UNESCO (Petersburg’s World Heritage Site status is threatened if the skyscraper goes ahead) and to Russian President Medvedev (a native Petersburger). Or picket one of RMJM’s many offices around the world. Thanks for the mention; I have posted under Mr Kettle’s AJ ‘snake oil’ article a link to this site.